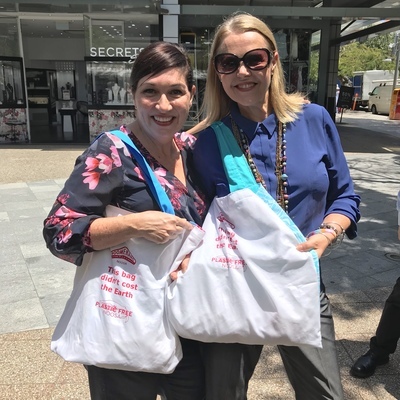 Environment Minister Leeanne Enoch and Noosa MP Sandy Bolton go plastic free. THe Boomerang Alliance estimates that since February the Plastic Free Noosa campaign has eliminated 1.4 million single use plastic items from use in Noosa. Plastic Free Noosa is part of a national program run by the Boomerang Alliance to promote a community-led switch away from single use, takeaway plastics. The project directly engages with cafés, food outlets, events and markets and assists them to reduce plastics through avoiding their use or replacing with reusable or 100 per cent compostable alternatives. Project manager Kellie Lindsay said the key to their success had been a straightforward, quantifiable plan and direct engagement with our 141-member café’s, restaurants, market and event members. “We work closely with businesses, as well as Council, tourism and business groups, suppliers, manufacturers, composters and waste operators to deliver real solutions to those businesses,” she said. “It isn’t enough to just ask them to remove plastic. We provide them options on what they change to, discuss viable business models for them, give resources and direct contacts to suppliers and clarify mislabeling and misconceptions about products. We also explicitly consider where that product ultimately ends up, which is important to us as well. “We do a lot of behind the scenes work to make it easy for businesses and events to make the switch.